Proper soil conditions are essential for healthy grass. One of the most important factors in healthy lawn establishment and growth is the soil pH level. Test your soil before establishing your lawn, and change the soil pH only if necessary. Your county extension office can assist you with soil testing. A pH level above 7.0 indicates alkaline soil, and a pH level below 7.0 indicates acidic soil. Factors that influence soil pH include fertilizer use and rainfall. Although most turf grasses tolerate pH levels between 5.0 and 7.0, the preferred soil pH level varies with different grasses. An ideal range for Bermuda grass, zoysia grass and rough blue grass is 6.0 to 7.0. On the other hand, sheep fescue and velvet bent grass prefer pH levels between 5.0 and 6.0. Ornamental grasses generally tolerate soil pH levels between 5.0 and 8.0. 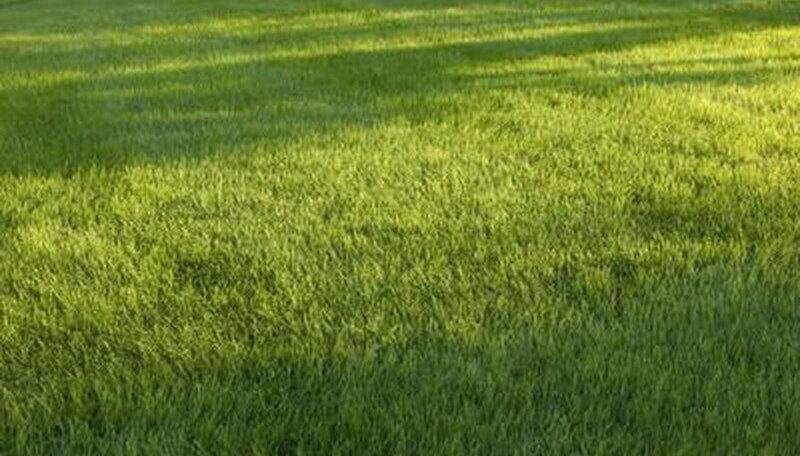 In acidic soil, nitrogen, phosphorus, potassium, calcium and other nutrients become less available to grass. Use ground dolomitic or ground agricultural limestone to raise the pH level. To promote deep rooting and nutrient availability, incorporate the limestone into the soil before planting. Test the soil every one or two years to determine the need for additional limestone. Water the lawn thoroughly after a surface application to remove limestone from the grass. Micronutrients such as boron, copper and zinc become less available in alkaline soil. Fertilizer that contains ammonium sulfate, ammonium phosphate, ammonium nitrate or urea can take a year or more to acidify soil. Sulfur acidifies soil faster than fertilizers. Incorporate sulfur into the soil before planting. To avoid burning after surface applications, apply sulfur during the rainy spring or fall seasons. Soil pH levels can affect grass health. When extreme pH levels cause nutrient deficiencies, grass loses its color and becomes less drought tolerant. The Cornell University Plant Disease Diagnostic Clinic states that pH levels between 5.0 and 6.0 help to control summer patch disease. A pH level above 7.5 increases the risk of iron deficiency chlorosis, especially in bluegrass and zoysia grass. Soil microorganisms that help to maintain soil health perform best at pH levels below 7.5. Ohio State University Extension; Lime and the Home Lawn; John R. Street, et al. How Does Sulphur Work on Lawns?